The news cycle throughout 2017 has been full of stressful, yet utterly predictable and unsurprising developments. The Republican Party decided to cap off the year by passing their unpopular tax reform bill—the vote was almost entirely along party lines, at 227-203. The $1.5 trillion Republican tax bill will go through the Senate for a vote tonight or Wednesday, with the GOP hoping for President Donald Trump to sign the bill into law by Christmas. As if a lump of coal in our stockings wasn’t enough. Ryan is correct that “people” will get their money back—corporations are people too, as we all know. The “things that the cynics scoffed” at have to do with the fact that these “people” getting “their” (middle class citizens) money are corporations and wealthy Republican donors. So the GOP is certainly fulfilling their campaign promise for tax reform by the end of the year—but by doing so, they will reduce the corporate tax rate from 35 percent to 21 percent. While individual tax rates for all income tax levels would also be cut, the largest cuts would go to the wealthiest Americans, according to the nonpartisan Tax Policy Center. The tax bill also repeals part of the Affordable Care Act, voiding the requirement for nearly all Americans to be covered by health insurance or pay a penalty—this change, while reducing government spending, is projected to eventually leave 13 million fewer people without health insurance. There are more downsides to this development that we’ve already pointed out before. 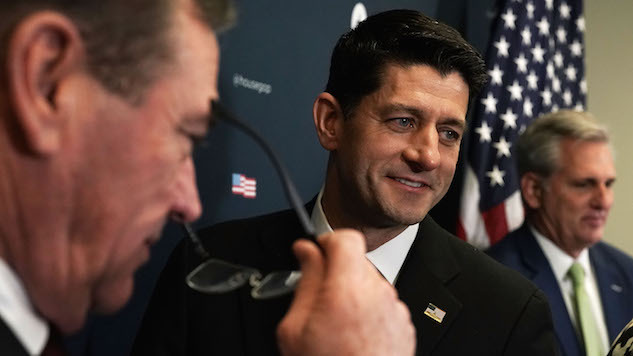 This quick and substantial overhaul of the tax code looks to be absolutely damaging to the country, and for now, all we can do is watch Paul Ryan gleefully bang his gavel as he also eyes for the exit sign. Merry Christmas, indeed.